“April showers bring May Flowers.” I remember hearing this often as a child. May has been a beautiful month here in the Washington DC area, and as it gets warmer, many exciting events come to town. In May, I had the honor of attending an event called Advocacy Day. 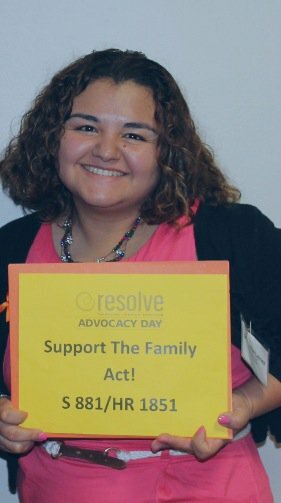 Advocacy Day is an event hosted by the organization RESOLVE, where men and women meet with members of Congress to voice the problems that the infertility community faces. As a woman who has experienced secondary infertility at age 24, and as a family-building professional at Donor Egg Bank USA, I was anxious to help make a difference. I wanted to provide awareness to the young Congress staff members that infertility is a disease that does not discriminate based on your age or race. I felt empowered to have been able to meet with members of Congress and express the infertility issues many encounter. We are fortunate to live in a country where Congress opens their doors to hear their community’s needs and problems. Many people assume that if you’re young, you will get pregnant in a heartbeat. Others think that because you had a child earlier in life, it will be a piece of cake the second time around. Things aren’t always that simple. Infertility can happen to anyone. Perhaps it is due to premature ovarian failure or maybe you were injured at war while serving our country. Whatever the cause of your infertility, you still have the right to be a parent. As modern science and technology evolves, it helps more men and women start their family. However, there is a financial burden behind infertility treatment. RESOLVE provided data from their surveys. Nearly 50 percent of people do not have insurance that covers an IVF treatment. For those who do have insurance coverage, it is a limited scope of treatment that is affordable for reproductive diseases. A client of Donor Egg Bank USA explained that her only dream was to become a mother. She had spent her life savings to undergo fertility treatment using frozen donor eggs. This woman worked as an employee of a coffee shop and she did not have IVF insurance coverage. Thankfully, she was successful on her first frozen donor egg cycle and reached her dream of parenthood; however she is now left in financial distress raising a baby without a financial cushion. This story is a true example and an eye opener as to why Congress should support The Family Act. The United States is said to be a country of liberty and justice. Is there justice for those who experience infertility? I have faith that there soon will be more options to make family building easier. As a taxpayer and advocate for those with infertility, I hope that our voices were heard and that Congress supports the Family Building Act. I would like to see our country as a place of hope, where we can make our dreams come true.